← Karate Kid #3: my DC Bicentennial blog continues! All Star Comics debuted in summer of 1940 as a quarterly comic book in the genre’s golden age. It was an anthology series and its first two issues featured the best strips from other comics published by All American Publications, a subsidiary-yet-separate-but-equal partner of National Comics/DC. It changed format with Issue #3. It also changed the history of comic books. Issue #3 was the debut of the Justice Society of America. It was still an anthology of separate stories, but the stories were framed by the first meeting of the JSA – all the heroes together swapping tales. With issue #4 the comic featured one story told in separate chapters – each chapter featuring an individual member of the JSA typically written and drawn by his (my choice of gender is intentional) usual team. Each issue was bookended beginning with the heroes meeting and identifying a crisis and ending with their uniting to finish off the bad guys once and for all. For example – the JSA learned of a fifth column spy ring. Then each chapter starred one hero defeating part of the ring. In the final chapter the heroes united to crush the leader of the ring. Later issues (because of cuts in page count), the heroes teamed up two or three to a chapter. It was the first time individual heroes met and fought together – as opposed to heroes who were teams at their inception. The Justice League, Suicide Squad, Avengers, Defenders, Teen Titans, The All-Winner’s Squad, The Mighty Crusaders, etc. all owe their existence to the Justice Society. And if for no other reason, All Star Comics would make history in issue #8 with the debut of Wonder Woman. The fun lasted until issue #57 February 1951 in a tale ironically called “The Mystery of the Vanishing Detectives”. Superheroes were on the outs and thus the title of the comic was changed to All-Star Western and the JSA replaced with a western anthology. All-Star Western ran until #119 in 1961, when it was finally cancelled due to the Silver Age revival of superheroes. In a sense, the guys in capes got their revenge… The last features in the comic were superhero-y characters like Superchief. 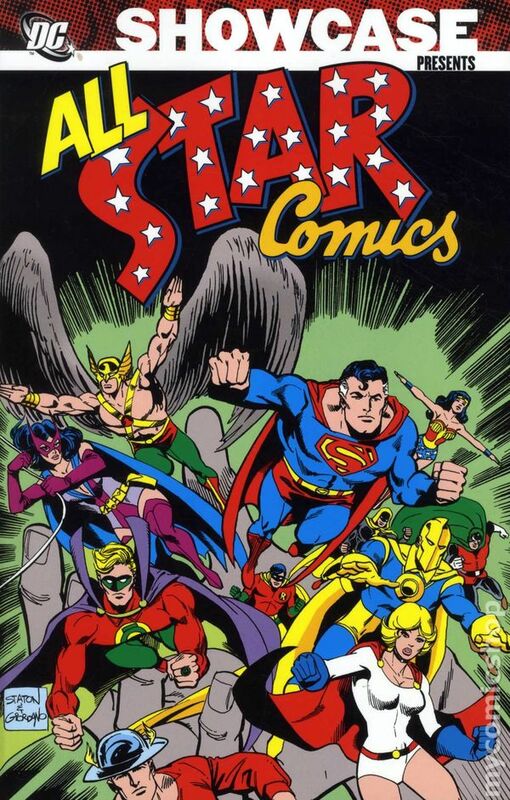 All-Star Comics was brought back in February 1976 with issue #59 – ignoring the numbering of its western incarnation. 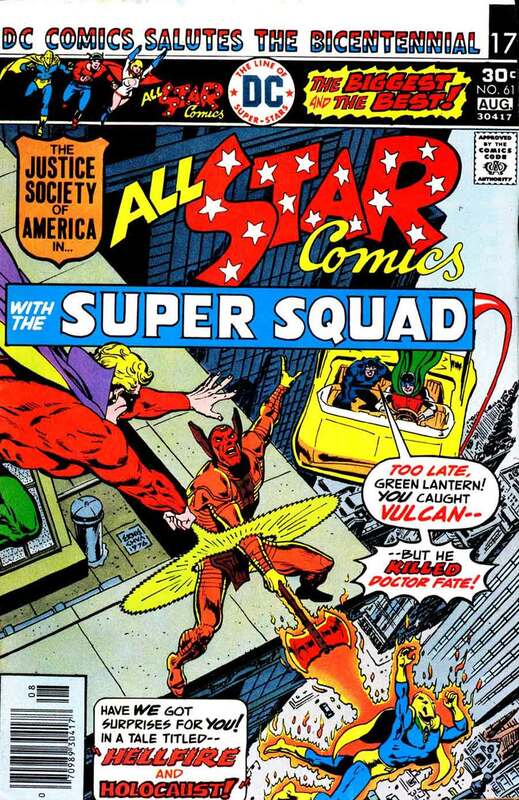 It starred the JSA but also introduced a new team within the group – the Super Squad. This featured the trio of the now-adult Robin, the Star Spangled Kid (who was trapped in time and rescued in Justice League of America #100-102 and was once in the golden age team Seven Soldiers of Victory or Law’s Legionnaires), and a new character Power Girl – Superman’s cousin, the Supergirl of Earth-2. This revival lasted until issue #74 and was cancelled as a result of the DC Implosion. By then the character Huntress was introduced. Stories slated for subsequent issues were published in the dollar-sized Adventure Comics. As is usual in comics in those days (and these days, too), this is a continued story. Although this story concludes with the defeat of the main villain, it still ends on a cliffhanger and there are enough threads leading to upcoming issues to prevent this issue from being called “done in one”. Astronaut Christopher Pike was transformed into Vulcan during a trip around the sun (the Star Trek references are obvious and intentional). Vulcan, Green Lantern and Dr. Fate battle. Vulcan escapes after causing a building to explode leaving Dr. Fate’s … er … fate in the balance. Lantern digs through the rubble as best be can (lots of wood in the rubble, you know) looking for his friend. While fleeing, Vulcan briefly and mysteriously loses, and then regains, his powers when the sun comes out from behind a cloud. Cut to other JSAers Power Girl, Star Spangled Kid (hereafter SSK) Flash and Wildcat stand by as firemen put out the JSA headquarters set ablaze by Vulcan in the prior issue. Flash’s wife Joan appears and begs him to leave with her, fearing for his safety. He does. SSK calls other JSAers for help. Dr. Midnite and Hawkman respond just as Green Lantern send out an SOS. They finally find Fate in critical condition. Power Girl left earlier, hearing a police bulletin about a UFO landing in Gotham. She confronts the alien and learns Vulcan’s secret. 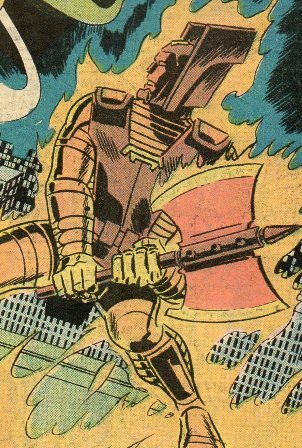 The alien, Xlk-Jnn “saved” Pike when he crashed into the sun by transforming him into a creature that absorbs heat. PG and the alien confront Vulcan, already in battle against Hawkman and SSK. Vulcan destroys the alien that turned him into a monster. Power Girl tells the JSA of Vulcan’s weakness (told to her by the alien): sunlight! SSK feeds Vulcan enough sunlight with his cosmic rod to destroy him. Mike White of Mackinaw, IL (positive) and Scott Gibson of Evergreen, CO (positive, but is confused by the long title of the comic and asked who is on what team: “The Justice League of America in All Star Comics with the Super Squad”) contributed letters.